Hello! Here we are already on our third day of the Easy As ABC knit along. Today we're going to be dividing the sweater at the raglan shoulder increases. Two parts for the body and two sections form each sleeve. After this step it really starts to look like a sweater for a tiny human! If you'd like to see the first few posts check these: Intro, Supply List, Day 1, Day 2. Here's my sweater with the increases complete. I have 144 stitches on the needle and 4 little stripes. We'll need our yarn needle and two scrap pieces of yarn. The first section of the sweater between the first two markers is the first sleeve. We are going to move these stitches off to holders and then work on the body. You can use stitch holders for this step but I actually prefer to use scrap yarn because it's softer and I always have it available! It's a good idea to use a smooth yarn and it should be the same gauge or slightly less than the yarn you are using. I have about 1 yard of Wooly Worsted yarn in a contrasting color cut into two pieces. Thread your yarn needle and gently start lifting the stitches from the left knitting needle on the the yarn needle. Gently slide them along the yarn making sure to leave a long tail so the stitches don't fall off the back end. When you've captured all the stitches between the two markers, tie your scrap yarn in a bow. Here's what we have! A loop of live stitches that are just hanging out, waiting for us to get back to them later. Our pattern now tells us to cast on a few stitches. To cast them on we'll use a knitted cast on. TURN your work to the WRONG side, pick up Color A and knit into the first stitch on the left needle. Lift that stitch up and place it on the left needle. Repeat the step for the second stitch by knitting into the previous stitch and slipping the new stitch onto the left needle. Two stitches added in Color A. 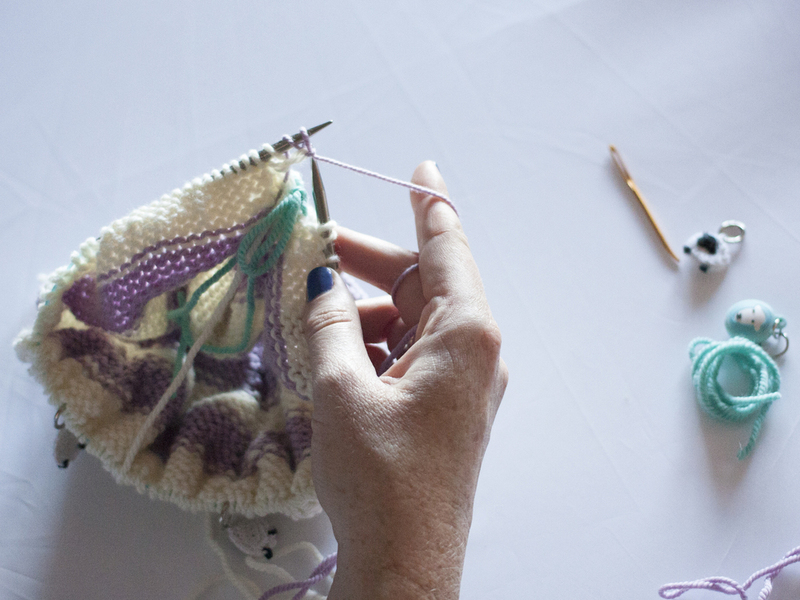 TURN your work back to the RIGHT side and knit across the gap created by the arm stitches. Continue knitting around the row and across to the next stitch marker. Remove the marker. Thread the second piece of scrap yarn. Move the next set of stitches over to the scrap yarn toward the next marker. Turn your work and cast on two more stitches. Continue knitting around and around and remember to carry your Color B yarn along with you. Add your stripes when necessary and work down the body. As you reach the bottom change to the size US 7 16" circular needles for the ribbing. When you bind off you'll want to make sure it's loose and flexible. Baby tummies are squishy and we don't want the sweater to bind up on there! If you bind off tightly, try using your size 8 needle in your righthand and knitting on to that to help keep your bind off more relaxed. I will see you again at 10 am Eastern on Thursday for our arms! Keep posting pictures on Instagram and Twitter with the hashtag #EasyAsABCKAL. I love to see them! If you have a question you can ask it in the comments here or in the Ravelry group. Email me if you want, heather@eweewe.com. See the Intro, Supply List, Day 1, Day 2.